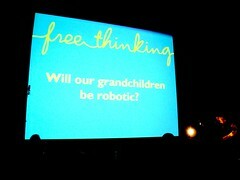 This morning, Beatriz and I strolled down to the BBC Radio3 Free Thinking festival taking place at FACT. Two of our friends - Jude Kelly and Nick Bostrom - were presenting at the same time though in different rooms, so we split up and re-grouped afterwards, taking in lunch with the 'robotic' panel afterwards. This also included Fiona Coyle from CeSAGen at Cardiff Uni and it was good to meet her as I know some of her colleagues quite well. She also injected some much-needed critical theory into the posthuman debate. Dylan Evans was articulating the 'hang on a second' perspective and told me about his very interesting 'utopia experiment' project in Scotland, where he has just moved. It was a good chance to see FACT at full-speed and the debate I saw was well-attended, especially for a Sunday morning! 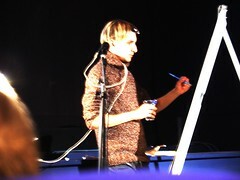 Artist Neil Harbisson was present with inventor of his Eyeborg Adam Montandon. Coincidentally, I had seen Neil before at the Bankside Gallery in London, where he was performing at the Sense and Sensuality exhibition.